The people are friendly, kind, considerate of one another. There is great camaraderie. We rally around when someone is ill or otherwise in need. If you are new, or newly returned after an extended absence, you will be noticed and people will greet you before the service. You will be invited to coffee hour after the service. Don’t expect to move around much as the Peace is passed… the aisles are always clogged with folks shaking hands and exchanging hugs. We are a close knit family… and family oriented. The contemporary service is especially good for younger children and has terrific music. Our holiday services are a real treat — for the soul, the ear, and the heart. The two “flavors” of our services (Contemporary and Traditional) differ, but both are uplifting. One or the other is sure to “fit” your taste. Every Sunday, there is a group of people who go out to Brunch after the second service. Anyone is welcome to go along. We try a variety of local eateries. We have many really good cooks and bakers. Sample their gifts at Wednesday Soup Supper during Lent and our pot-lucks. Watch the calendar, newsletter, and bulletin for other Activities. You and yours will be welcomed. If you have the time and a talent or passion to share, we welcome that too. Our choir can always benefit from more voices. Our Children’s and Adult Study programs welcome new participants and new teachers and leaders. Our talented cooks are willing to share the tables (and maybe trade a recipe or two). Check out other Opportunities on this web site. we trust in a God who loves all people and we try to exemplify that love. Most of these settlers were devout Lutherans who wanted a church where they could worship in their native tongue like their forefather’s. In 1848, they began holding services in their homes with the aid of itinerant clergy. In 1853, they received a grant from the Weymouth Company for a plot of land for their first place of worship with a cemetery. 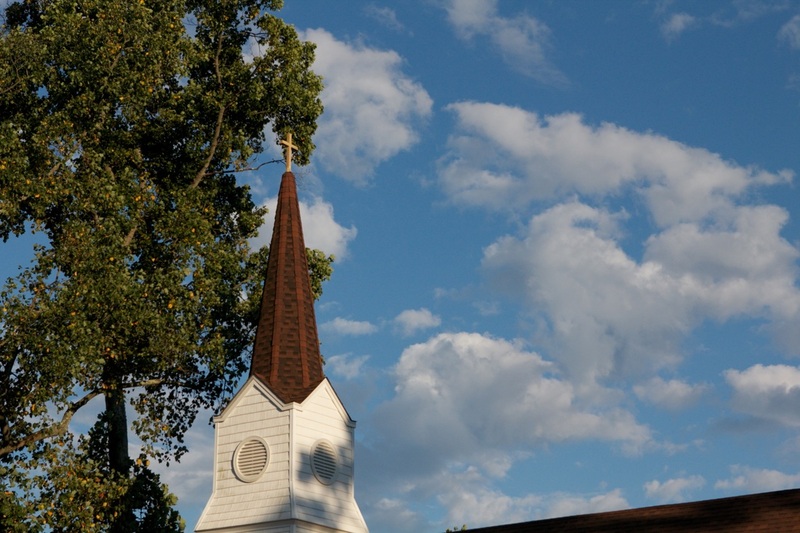 They purchased a church bell that hung from the trestle, which rang a call to Sunday service and for a day school that was also held in the church building. German and English were taught in the school. They boys sat on one side of the room and girls on the other side. The church service was also segregated, with men and boys on one side and women and girls on the other. There arose a division among the members of the church. One reason for the discord was the way in which the Lord’s Prayer referred to the deity. Some said it should be “Unser Vater”, which in English is “Our Father”, and other’s wanted “Vater Unser”, which means “Father of Our’s”. Another reason for discord was the fact that some members thought that the service should be in English and others felt it should stay in German. (They were not ready to change with the times, so it seems). In 1852, the conservative Lutheran worshipers and the more progressive Lutherans divided the six acres of church property equally. The ground that became St. James’ included the land where a one-room school was built. As they built the church building, they used native stone. The new building had a tall spiral on top with a weathervane. The name of the church, St. James Evangelical Church, was placed over the door. Over the door of the original church, the sign read “Deutsche Reformed Zion Kirche”. When the congregation divided, representatives from both churches drew up the agreement for the division of the properties. The representatives for the Lutheran congregation were Charles Rehmen, J. Rohde, Casper Whitmyer and the Reverend J. Leonberger. Representatives for the Reformed Church were Joseph Eckhardt, Christian Kramer, Jacob Blazer and the Reverend M. Frankel. The bell that to this day is in the belfry of St. James was purchased for $55.00. It was hand made by Mr. Christian Spies, who was the grandfather of Mrs. Eugene Schulze (Mamie Whitmeyer). Mr. Spies was employed for a time in the Philadelphia Bell Foundry. The bell had many uses. It rang every Sunday to call worshippers to service. It rang while the Lord’s Prayer was being prayed so anyone ill or otherwise in the community could pray along with the parishioners. It also rang when anyone passed to his or her eternal resting place, as well as at funerals. The bell also rang for weddings and New Years, and was used to signal emergencies. True to German customs, men dominated the church. Women were not even listed as members. The common cup was used for communion for many years. Once the church building was complete, the people needed a pastor, and many attempts were made to secure one. The Evangelical Lutheran Synod of Pennsylvania helped in sending the congregation their first full time preacher. His name was A.G. Georgin; he was from Camden. The preacher rode a horse from Camden for services here. There were no roads, only a dirt trail. Now I ask you – could you see our Pastor riding a horse here to preach? Did the original Pastor have to feed and water the horse before he preached? When Folsom borough was organized in 1906, the church members suggested that the borough purchase kerosene street lamps. A total of twelve lamps were purchased and placed along the road. The residents of the homes closest to the lamps were responsible to keep them filled, light them at dusk and extinguish them in the morning. The borough compensated them for the kerosene and wicks. This continued until electric lights were ordered in 1926. As the town grew, the church grew also. Starting with Pastor Georgin and including our most recent Pastor, Pamela Werner, there have been 39 pastors. Our congregation today includes families with ancestor’s whose membership’s date back to the late 1800’s and the early 1900’s. 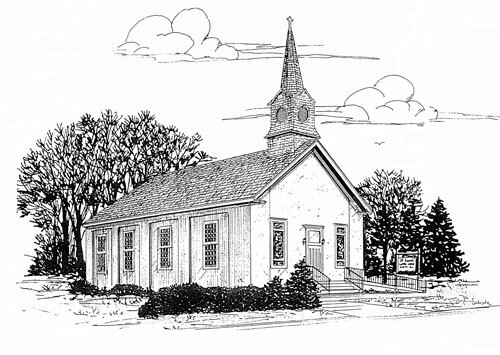 From the early 1940’s until 1956, we had supply pastors shared with St. John’s Lutheran Church of Williamstown. In 1956, the parsonage on 13th Street was built with anticipation of calling for the first full time pastor. Pastor Strohl answered that call. While he was with us, he led our congregation to grow greatly. We were able to build a Parish Hall, dedicated in memory of Mr. William Schellhas in March 1961. It houses our Sunday School rooms, and is used for social functions. Mr. Schellhas was one of the forefather’s of our church. In the 1980’s the building was destroyed by fire and rebuilt to its present state. We now have a conference room and the pastor’s office. We have renovated the inside of our church, removing the balcony. The worship area has been reversed. What we see now as the front of the church, where the altar, organ and choir areas are located, was originally the back of the building. 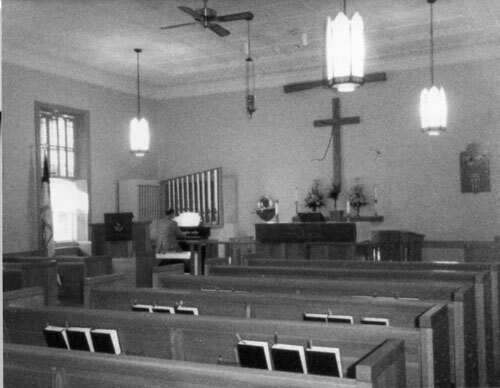 There was an addition built to the church that houses a large vestibule, restroom, and room for housing the choir robes, paraments, and communion ware. The addition also included a ramp for the handicapped. This addition was dedicated in 1993 in loving memory of Marion and Harvey Norcross. They were faithful pillars of our church and we surely miss them. We also have made great improvements to our cemetery, and at this present time are in the process of beautifying the church grounds. A short time after our 150th anniversary celebration, a few members of the Zion Church next door approached our council and said their membership had decreased and they were only having services once a month. They asked if we would like to have the church, the property and the members that were left in addition to the finances they had. After looking into the legal aspects, we generously accepted. We had a special service to mark their members joining our congregation. After the church service, we gathered around the flagpole that is between the two churches and had a ceremony of “burying the hatchet” and now we are one. It seems like we just celebrated our 150th Anniversary! Our theme, “Building For The Future”, has took off very well and we are blessed to have the Leroy von der Tann Foundation helping us finance our projects. Much has happened since then. Pastor Ronning, and then Pastor Mattei moved on to serve other churches. Pastor Pamela Werner accepted the call to our church in 2011 after serving a year as our vice pastor. We started our building program in 1987. Initially, we had visions of constructing a much larger Sunday School Building with more classrooms and a big community room, but the cost of such a building was too much for our small congregation. We changed our strategy and extended our coffee area to the end of the existing Sunday School building and added new offices for our Pastor and secretary. This has opened up two additional rooms that can be used as classrooms or meeting rooms. We were very fortunate to receive donations from four families to purchase stained glass windows for our sanctuary. This has added to the beauty of our church. Our current construction project will enlarge the Narthex, creating a better reception area where people can greet each other before and after the services, but will also provide better flow for funerals and weddings. With the help of the Leroy von der Tann Foundation and support from the congregation, we continue to make great progress with our building program. The Foundation also established a scholarship program for our youth pursuing a college education. All the distributions from the Foundation are made from the dividends so that the Fund does not diminish and will grow for years to come. What started out in 1848 as a congregation that then split, was reunited once again. We are sure God had his hand in all of this. We now call the historic church St. Jacobus and use it for special services. Our congregation continues to grow in ministry and in spirit. In another 50 years, what will our member’s say about our history? I’m sure there will be faster cars, maybe helicopters of some sort. We will still have families who will say, “I remember when…”. As we go along, we accumulate and record history. I’m sure when this church celebrates at it’s 300th anniversary, they will wonder how we did it. We pray our descendants carry on for the Glory of God. Now in closing, I take a prayer from the dedication of our church in May 1853, which is just as timely for today.